Composed by Bob Good. Contemporary Classical, Repertoire, Folk, Recital. Score, Set of Parts. 1 pages. Published by Surrey Dance Music (S0.441049). 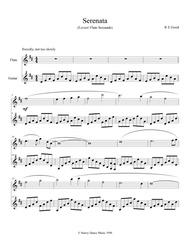 Arrangement of the gorgeous Serenata for flute and guitar.